Maine is lucky to have some of the country's most pristine, healthy waters, full of aquatic diversity and quality fishing. These waters provide endless outdoor recreation opportunities for anglers and others, but they are also threatened each year by invasive species. What is an invasive aquatic species? An invasive aquatic species is one that has been moved from its native aquatic habitat to a new location, even nearby, and causes significant harm to that new environment. Invasive fish compete for food and habitat with native fish, may prey on smaller native fish, and can forever change the natural balance of an aquatic ecosystem. In recent years Maine's lakes and rivers have experienced dozens of illegal introductions that pose real and immediate threats to our native fish populations, especially brook trout and Arctic charr. Some invasive plants are more than able to strangle a body of water. These plants are fast-growing and can quickly multiply and spread into a thick blanket that keeps sunlight from penetrating deep into the water. This inhibits the natural growth of algae and plankton, which small fish need for food. Once an invasive plant kills plankton, small fish are likely to starve — a situation that detrimentally impacts larger fish and the entire body of water. Once an invasive fish or plant has established itself in a body of water, it is extremely difficult to eradicate them. Eradication efforts are costly, can carry their own risks, and are not always successful. Therefore, prevention is key. It's our duty as those who enjoy using Maine's waters to protect them against invasive species. 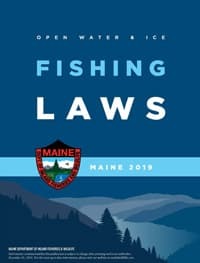 Under Maine law, you must immediately kill any fish that you decide to keep, and never transport any live fish (other than legal baitfish). Make sure you're using legal baitfish. A quick guide to identifying common legal baitfish species appears on pages 56-57. Don't dump your bait! Properly dispose of unused baitfish on land or in the trash. Do not release any live baitfish into a water body. Before leaving the launch, check your boat, motor, trailer and any other gear that touches the water, removing any bits and pieces of plants. Don't assume a dry plant is dead – some invasive plants can dry out while on equipment, re-saturate when exposed again to water, and survive to spread in the next body of water they enter. If you see or suspect someone is moving live fish, contact the Maine Warden Service immediately at 1-800-ALERT-US or report the offense at MaineOGT.org.